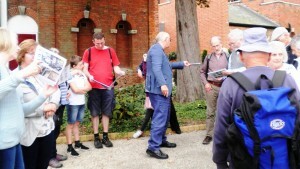 We had a marvellous response to the Heritage Open Days with 231 visitors (222 adults 9 children) and 100 squeezed onto 7 history walks. We also received many requests for details of our Talks & Walks programme. All clubs, societies and similar organisations are invited to apply. Additionally, the walks are available to family groups.